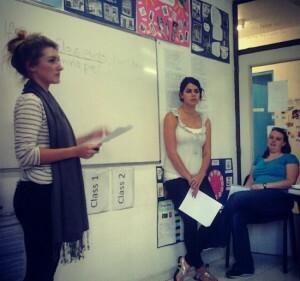 Embarking on a TEFL course was the typical ‘now or never’ moment for me. My degree was in Textiles, but I soon realised it wasn’t my passion, and I spent many hours in pointless jobs, thinking ‘what can I do that’s useful to someone?’ At 25, I had never really traveled before, and wanted to challenge myself, whilst young(ish) without commitments. Coming from a small town in Yorkshire, I felt a little closeted and wanted to broaden my horizons. 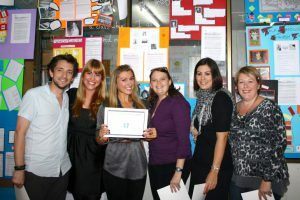 That’s when I googled TEFL courses, and TtMadrid popped up. Little did I know the great things it would lead to! So 5th September 2012 was the first day on the course. A big group, I met so many great friends from all walks of life. A far cry from my small town bubble in Yorkshire. We had a warm welcome and thorough introduction to the Tt staff, and were told ‘this will be the longest, shortest 4 weeks of your life’. A phrase that would often be repeated! They weren’t lying. It’s a busy month, and you are given so much information. For someone like me, with no previous teaching experience, it proved vital to give me a basis to start my new career. For me, the teaching practises were the toughest part of the course. Sounds stupid, as this is what it’s all about after all. But being observed by tutors and peers, although nerve-wracking, was so useful. This is where you find out what kind of teacher you are. With constructive feedback, you can really hone your strong points, and develop weaker ones. At TtMadrid, the support network is very strong. Although stressful, I always found there was someone to voice my concerns with. Even now, almost a year later, they’re so helpful, I always know their door’s open if I have any problems. Of course, teaching is a job that can’t be taught in 1 month. That’s what’s great about it. You’re learning continuously, and it’s so fun. But without TtMadrid, I certainly wouldn’t have the confidence I have now. The methodology, lesson planning techniques, and advice given on the course provided me with a solid, well-rounded foundation to build my skills on. From there, it’s on-wards and upwards! The day I graduated, I got my first job, teaching managers in-company, for Telefonica. The following week, I got my second job, teaching children in an academy. These roles couldn’t be more different, but I love the variety. No two days are ever the same, and I’m so proud of all that I’ve achieved this year. For now, Madrid is my home. My life has changed beyond belief in less than 1 year, and I’m happier than ever. Next challenge: Learn Spanish!